Enterprise Content Management vs. Document Management Software. Enterprise Content Management vs. Document Management Software. What’s Different? The transition to the electronic documentation flow and retention is one of the characteristic tendencies of the modern world. A lot of organizations face the problems of choice and launch of ECM systems. What Is a Document Management Software (System)? In a great number of companies, a DMS used to be a person. If you needed a document or a record she was one you contacted. This person had a key to a high-security record room. She tried her best to somehow bring some order to the files directory cares. Thankfully, these days are over. A modern document management system is more than just a digital replication of the record room. In only one click you could find records and documents what had taken your employee days to dig out. You can also access documents and records in the business contacts. You are able to leave comments or notes to your colleagues. This makes working together much smoother. Automated workflows support your daily work. DMSs are also known as EDMS (electronic or enterprise document management system) which function as a program for creating, storing and monitoring the documents electronically. Software to monitor, store, and control documents. Means for storing and processing content and documentation flow in an enterprise. Digital files that are kept securely. A superpower DMS. A simple and a clear tool which is easy to use. A sophisticated system that needs high responsibility. Monitors the entire flow of documentation (creation, storage, accessibility). Manages all types of documents including video, images, emails, graphics, web content, etc. Meets the initial needs of a company. Ensures high security and risk control. Works well for lawyers, doctors, college workers, etc. Is good for processing structured documents in different formats. Is good both for structured and unstructured information. Designed to digitize and archive data. Developed to process and measure data. can be reached from mobiles. Oracle enterprise content management (also known as WebCenter Content) is designed for managing documentation in enterprises. It offers a bunch of benefits: from cutting costs to creating value with the help of highly useful business content. IBM enterprise content management solution offers a lot of advantages among which there are the following things: customer support, patients insights and care, intelligent investigation managery, HR documentation. ECM Microsoft Sharepoint content management system has the following benefits: metadata, records, web content, documents, and digital assets. It’s quite difficult to make an ECM comparison chart as the solutions may have a lot of similarities and differences. 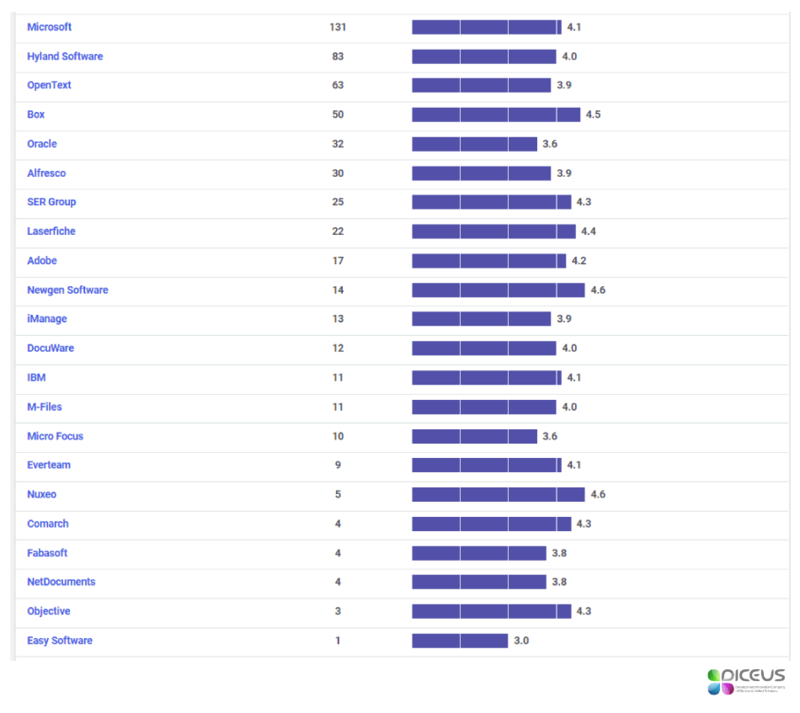 You should know first the initial needs of your company to choose the best ECM platforms that fit your business goals. In case you need the best enterprise CMS but you can’t find a suitable one among the existing platforms, try custom development services. A lot of companies including Diceus provide custom design and development according to your requirements. How does it work? Tell about your needs. Once CMS experts are ready with an SRS paper you will be provided a detailed description of a future product and a clear estimation of costs. It’s quite convenient as you no longer need to look through dozens of ready-made tools and solutions for organizing papers flow. Instead, you get a platform that is user-friendly and clear to any member of your organization. We work with different industries that’s why it won’t be a problem to conduct in-depth research and analysis of your needs and to offer the best business logic. What Is Document Management Gartner Magic Quadrant? Gartner is a research and consulting platform that collects peer reviews and insights analyzes information and forms unbiased rating lists accordingly. A magic quadrant is a graphics market overview that serves as a perfect visual aid for making core business decisions like choosing a new business partner or a vendor. The reports are based on the product characteristics as well as on the entire company’s characteristics. 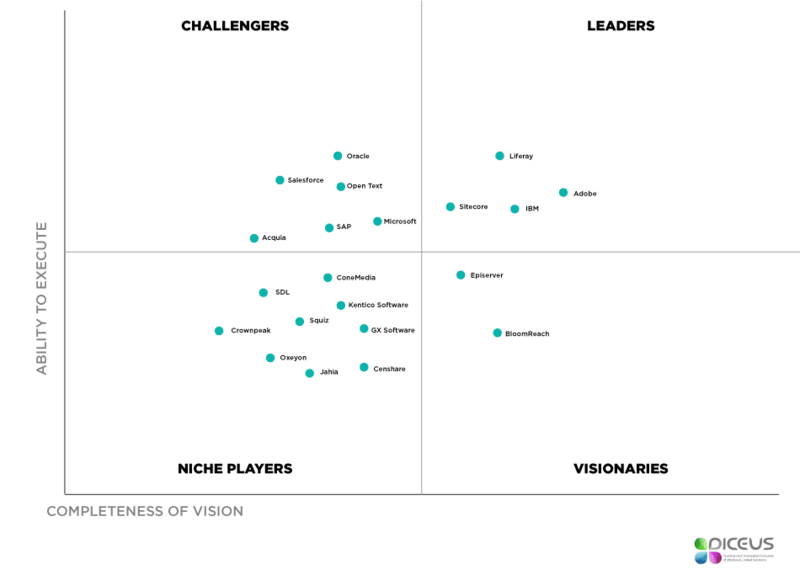 The quadrants are made of 4 categories: challengers, leaders, niche players, and visionaries. Should you have any additional questions about the effective approach to the content arrangement in your industry feel free to ask our specialists and consultants. Our business analysts will conduct an in-depth analysis to offer you the best-suited content management or document management system according to your business processes and company needs. They have expertise in a great variety of industries including finance, banking, manufacturing, sales and distribution, etc.